Registration for 2016 Sessions is Now Open! The learning starts top side - here junior sailors learn to rig their boats for what was an amazing first sail - just look at the wind in those sails! The information below is from the 2016 sessions. 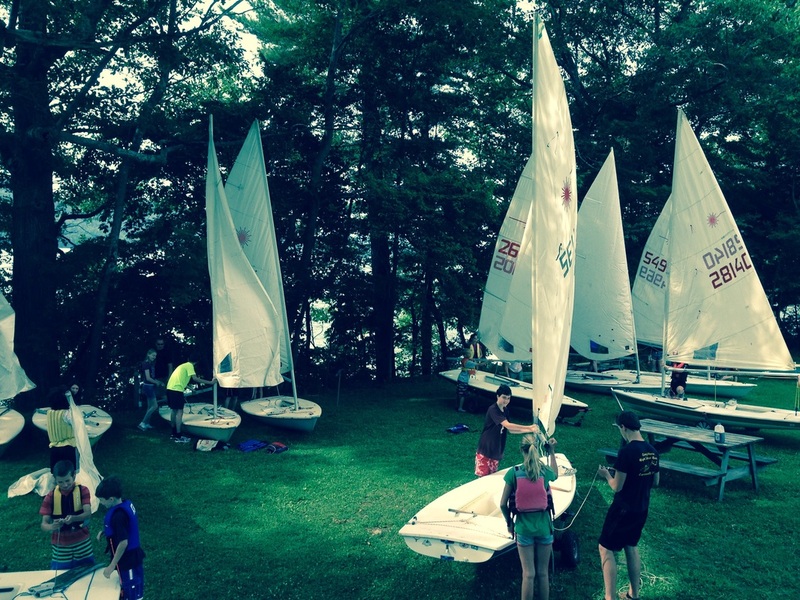 An afternoon day camp designed for kids ages 6-10 that emphasizes sailing concepts, teamwork, and skills development while offering other camp activities to keep everyone having fun. Optimist class boats. -The program costs $150 per session ( 5 classes/week). -Class size is limited to 20 students per course section. -Class starts at 1 p.m. and ends at 4:30 p.m., Monday through Friday. Supervision may not always be available before and after each class session. Please plan to stay with your student(s) until the instructors are ready to begin camp and please be on time for pickup. Students must pass a water safety test on the first day of camp. All students should have completed kindergarten by June 27, 2015. For young students age 10 and up with any previous sailing experience (OSC or comparable programs) seeking more on water time to advance their skills. Students must be able to make appropriate basic sailing decisions independent of instructor directions. -The program costs $300 per session (2 weeks, 10 classes). -Class size is limited to 8 students per session. - 5 or more students must be enrolled for a session to be offered; refunds will be offered if a session is cancelled. -Class starts at 9 a .m. and ends at 11:30 a.m., Monday through Friday. Supervision may not always be available before and after each class session. Please plan to stay with your student(s) until the instructors are ready to begin class and please be on time for pickup. A great opportunity for youth to learn and practice small boat sailing skills on Laser class boats. -Class size is limited to 25 students. -Class starts at 9 a.m. and ends at 11:30 a.m., Monday through Friday. A great opportunity to try sailing for the first time or jump on board again. Laser class boats. -The program costs $125 per section (2 weeks, 5 classes). -Class size is limited to 10 students per course section. -Class starts at 6 p.m. and ends around 8/8:30 p.m. for the first 4 classes. -The 5th and final class is a 'sail-along' on a Saturday morning starting at 9 a.m. Students will sail with OSC club members on several different types of sailboats. Students will have the opportunity to practice their skills as captain and crew as well as gain a sense of what is involved in being a sailboat owner. 2. Sailing Camp students should also bring snacks, beverages, sunscreen and other suggested items. See the registration page for details.